Tossa de Mar situated in an incomparable area of natural beauty on the Mediterranean embraced by the beautiful bays. Tossa de Mar is a town situated between the towns of Lloret de Mar and Sant Feliu de Guixols on the Costa Brava. In between the city of Barcelona and the French boarder. The closest airports are Girona 32km and Barcelona 93km. Situated in an incomparable area of natural beauty on the Mediterranean embraced by the beautiful bays of Giverola, Pola, Ca la Bona, Llevado, d’en Carles…and beaches such as the main beach and d’Es Codolar. Approximately 8000 inhabitants live on a permanent basis in the town, but during the summer months visited by some 15.000 tourists. The municipal district is mostly inside the natural reserve of the ‘Cadiretes’ with 519 metres altitude, conserving the Mediterranean vegitation along with some floral elements of the Atlantic. It is possible to travel the routes and paths indicated for trekking and mountain biking. 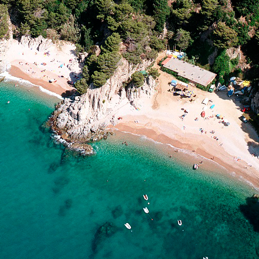 Tossa is surrounded by beautiful coves: Giverola, Pola, Cala Bona, Llevadó, ... and beaches: (Gran) Main beach and Es Codolar. Imagine a place where you can travel back in time and transport yourself into scenes from the past. 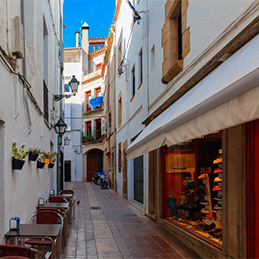 Enjoy the shops and market stalls in Tossa as well as the gastronomic delights that it has to offer. 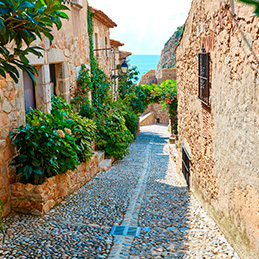 In Tossa de Mar, not only enjoying the touristic atmosphere, you can quietly walk through the old town ( Vila Vella ) discovering the arts of centuries of which the most outstanding is the enclosed, Xlll century wall covers rocky borders protecting the antique houses and streets. Above all, the Sant Vicenc church, built in Gotic style in the XV century, also the antique hospital of Sant Michael from the XVlll century. The centre of the town touches the beach, dynamic and full of life you will find small boutiques, bars, cafes and a large selection of restaurants where you can enjoy the exceptional local cuisine. On the outskirts is the neighborhood of the ‘Pescadors de sa Roqueta’ and the ‘Massis de Cadiretes’ the old sanctuary of Sant Grau. Not forgetting the antique origins of Tossa de Mar dated 1 ac represented amongst others by the Roman Vila Ametllers. Strolling by night along the ‘Mar Menuda’ beach,- that celebrates the blue flag – status to the Badia with its its views of Tossa and its walled ‘Vila Vella’ lit up in the backround, you can end your travels in one of the most touristic, artistic and historic areas of the Costa Brava.